As promised, we have a short but sweet video to share of our recent visit by a pod of humpback whales. Over the last six years we have been looked over by many pods of whales. If we turn off the electronics and shut down the engines our visitors will swim around and under us, checking out the hull shape’s distribution of volume no doubt. Click here for a two minute video. This entry was posted on Tuesday, July 26th, 2011 at 9:21 am and is filed under Cruising Slide Shows. Both comments and pings are currently closed. Try tapping the slider bar below the video. 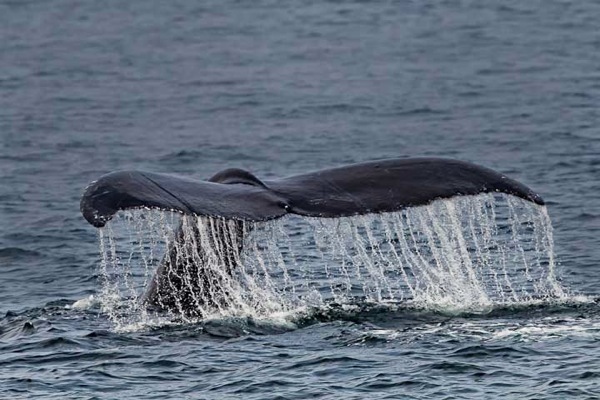 Whenever we go whale watching, we make sure the tour boat is powered by a waterjet system. The whales seem to like to play in the jacuzzi effect from the jets even when the boat is proceeding at very low speed. Being close to the whales in a boat with that type of propulsion makes me feel that the chance for injury to the whales is a bit less. We have a favorite twin jet cat touring boat out of a northeastern port that we like to use. By the by, it’s the 75th anniversary of the Spitfire!